The main event is the ANARE (Tas branch) Midwinter Dinner which will be held in Hobart on Saturday 21st June 2014. We encourage you to come along...it's sure to be a great night with a wide mix of ANARE expeditioners and their guests. Last year over 180 people attended. Each attending ANARE expeditioner is welcome to invite a guest to the dinner...husband, wife, partner, friend, son, daughter...whoever! If you'd like to receive our (very irregular) newsletter please click here... The newsletter provides information on ANARE, Antarctic and subAntarctic current news, upcoming events and Midwinter festivities updates. Following the success of the 2013 dark MOFO festival in Hobart, there are now plans to host a further dark MOFO Midwinter festival. Called DARK MOFO, the festival will embrace a number of events between the 14 to 24 June 2014. An interesting 1.5 hour guided walk showcasing Hobart’s rich Antarctic history and connections with local guides from Polar Pathways can be organised for interested groups, or individuals if sufficient numbers (around 10 people) . Cost: $15.00 pp. A minimum of 10 bookings are required for the walk to proceed. Participants will be notified of the departure point prior. Further tours can be organised for reunion or other groups on request. If interested please contact us. There is also the opportunity to do your own self guided polar pathways tour. Walking and driving options are available. Brochures can be collected from the Tasmanian Museum and Art Gallery, the Tourist Information Centre in Hobart , or a copy downloaded from the excellent Polar Pathways website. The Polar Pathways website also offers the opportunity to download additional information on Polar Pathways sites and explorers, by clicking here. To further enhance your experience of the Polar Pathways walking and driving tours, Podcasts are now available for all sites. Again these are available from the Polar Pathways website. Download all or just your selected sites and listen on your computer or transfer the Podcasts to your MP3 player and listen as you tour the sites. 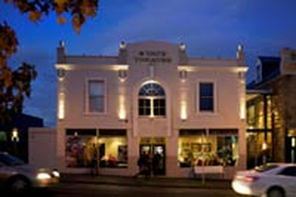 The Longest Night Film Festival is held at the State Theatre, North Hobart. A short season of cutting edge documentaries and historical film footage from the frozen south, and north! Open to all including members of the public. Further details of the program and session times will be available on the State Theatre website closer to the date.